Choosing the best mattress for back pain is critical for your health and well-being. But with so many different options out there – how do you determine which one would truly help you out? The mattress industry has been disrupted throughout the last few years with companies selling directly through the Internet without any middlemen premiums. This has made many products a lot more accessible. While having an abundance of back pain mattress options could help you achieve your health and sleep goals – it's also overwhelming. We've narrowed down our favorite mattresses designed for back pain and aches – we're confident you'll find something that gives you the level of support you're looking for. What Type of Mattress Material is Best for a Bad Back? Its comfort starts with a substantial cover that combines Tencel and long staple cotton, which is quilted with a gel memory foam. Followed by a three-inch layer of memory foam with medical-grade cooling and a one-inch gel memory foam, the result is a luxurious feel that helps regulate temperature all night. Why is it special? 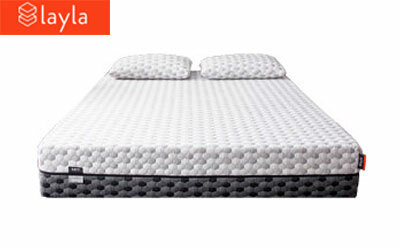 Nectar’s mattress has a medium level of firmness at a very affordable price tag. 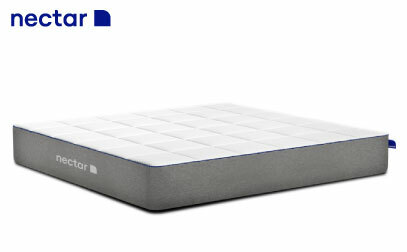 It is an all-around great value with three total layers of memory foam over a dense High Vegetable Base Super Core. To add to the overall value of the product, Nectar is an extremely low-risk purchase because you can try it out for a whole year. This will give you ample time to decide if this is the mattress you want to keep for years to come. It even has a Forever Warranty. For all features and details, head over to our detailed analysis. Nest Bedding’s Alexander Signature Hybrid comes in three firmness levels and their Medium option is our choice for premium medium-level firmness. Its hybrid design incorporates coils and memory foam for an unmistakably comfortable and supportive feel. What makes it unique? The Alexander Signature Hybrid is not only a solid option for those who find a medium level firmness sufficient to alleviate their back pain and aches – it also has great premium features. Its design and materials create a luxurious, comfortable feel. The cover has a Thermic Phase Change Cooling Fabric, which is followed by a highly-conductive and innovative copper memory foam layer that pulls heat away from the body. In the supportive coil layer, each coil is individually wrapped to help isolate motion. The bed is made to order and feels substantial at 13 inches thick. It even has convenient handles that make it easy to move around. Additionally, the company offers a Lifetime Comfort Guarantee. This means that if you want a different firmness or size after the initial trial period, you can purchase a new bed for half the cost. If you want to read more about Alexander Signature Hybrid, we have a detailed review here. Brooklyn Bedding refers to their Brooklyn Signature bed as #BestMattressEver, and there is a lot to love. It is available in three different comfort levels, including Soft, Medium, and Firm. Their Firm model is our pick for a firm feel at a mid-level price point. It is especially good for people with back pain who find relief from a firmer mattress and who do not like to sink into their bed. Because it is a firm mattress, people who sleep primarily on their stomachs or back will find it most comfortable. It has extra support that can be good for the lumbar region. What stands out? 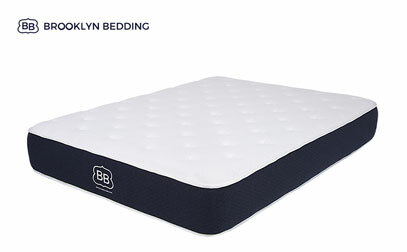 Brooklyn Bedding has updated the Brooklyn Signature to a hybrid design (from an all-foam design) to include individually pocketed coils in addition to its foam. The foam provides some pressure relief while the coils give additional support and help make repositioning very easy. Brooklyn Bedding owns their state-of-the-art factory, so they are able to cut down on costs. This helps them create savings for customers and to provide a premium look and feel for a good price. Want to know more about #BestMattressEver? Check out our detailed analysis here. 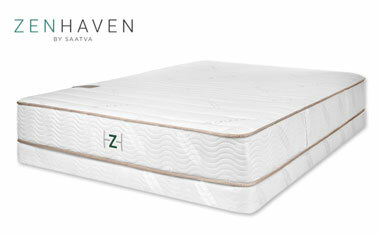 Well-established luxury brand Saatva has created the Zenhaven brand. This model has everything you would expect from the premium tier – from free White Glove Delivery and old mattress removal to exceptionally high-quality materials. Unlike most brands on this list, the bed is not compressed into a box. While this bed has two different firmness levels on either side, their Gentle Firm side is our pick for a premium firm option. If your back pain warrants a firmer mattress, you can enjoy the feel and luxury of this brand. What makes it special? Zenhaven’s construction has a proprietary “5-Zone” layer for targeted support made out of natural Talalay latex. The latex has different-sized pinholes in the zones to add extra ergonomic support, with a concentration on more support for the shoulders and torso. The bed uses a high level of natural materials in its construction. It has an organic cotton cover, an organic New Zealand wool flame-retardant that helps with moisture wicking, and its natural Talalay latex. For a complete list of features visit our in-depth overview here. Well-known brand Casper made further strides in the area of spine alignment through the update to their original design. The newest version of the Casper has Zoned Support™, which caters to spine alignment through adjusting the firmness in the shoulders region, as well as the hips and core area. What makes it unique? Casper’s Zoned Support™ layer of foam is softer beneath the shoulders and firmer underneath the hips and core. This helps to give pressure relief and support where needed and there are benefits for nearly every sleeping position. Side sleepers should be able to have their shoulders sink further into the mattress while the hips stay well-supported. Stomach sleepers can enjoy the medium-firmness of the bed without sinking in a way that throws them out of alignment, and back sleepers should find a comfortable level of all-around support. 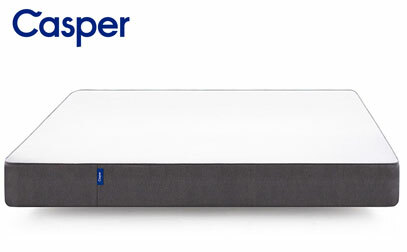 For all details of the Casper, see our full review here. Layla does an exceptional job of relieving pressure through its memory foam. If you like sinking further into a mattress and enjoy a slower response time, we think you will love the feel of this bed. While it has different firmness levels on each side (Soft and Firm), you can find the highest levels of pressure relief on their Soft side without having to worry so much about an extra firm feel. Side sleepers especially gravitate towards their Soft side, where there are a thick three inches of memory foam over two inches of convoluted (think egg crate shape) Air Flow foam. What stands out? Not only do we feel that Layla’s pressure-relieving capabilities are top notch – their memory foam is infused with copper. Known to be a great conductor of heat, it will help you stay cool all night long by wicking the heat away. Since Layla is dual-sided, you can maximize the 120-night trial period by testing two different experiences in one new bed. For full info, pros and considerations, and more, go to our full review. Although comfortable for nearly every type of sleeper, Bear Mattress shines for athletes and active folks. The brand believes that their product will boost performance and recovery times for those who are active. The mattress does a nice job relieving pressure while also providing bounce. It has a quicker responsiveness with an inch of slightly slower-responding memory foam on top. Why is it special? Bear uses a unique material in their cover called Celliant® that they say converts a person’s natural energy into infrared light through Infrared Yarn Technology. The company claims that it improves blood flow and tissue oxygen levels. We are not experts in the materials that make up the Bear, so you should conduct your own research into the science behind their product if you are interested in purchasing. It appears that there have been clinical trials and FDA involvement regarding Celliant®. Read our in depth analysis of the Bear if you want to learn more. Dreamfoam’s Ultimate Dreams Supreme 12″ Gel Memory Foam mattress is our budget choice for back pain. It has a supportive eight-inch poly foam base with two layers of memory foam on top that total four inches. 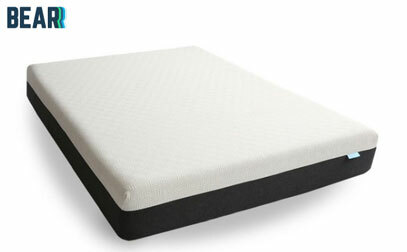 This is a good option for people who like the feel of memory foam or need pressure relief. 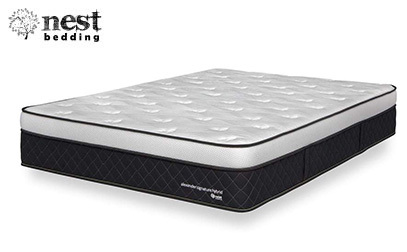 While less expensive innerspring mattresses may have painful coils, the foam in this budget bed has very comfortable contouring. A gel has been added to the top layer to help sleepers stay cool and to avoid the overheating some memory foam can cause. What stands out? In addition to being a quality budget buy, Ultimate Dreams Supreme has a true medium firmness to it. 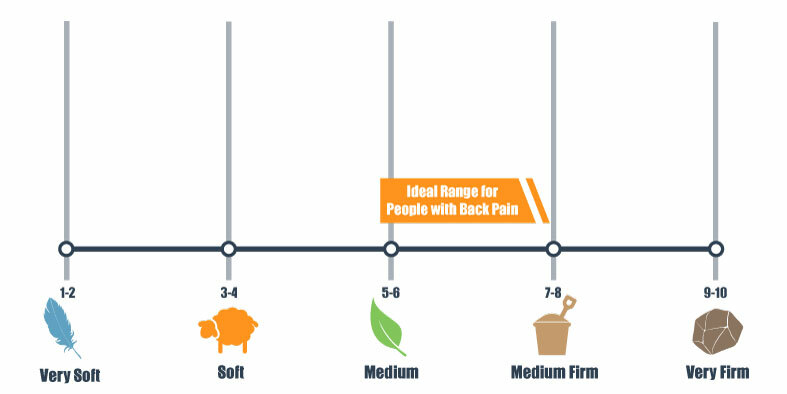 Individuals with back pain who are looking for a product in the middle of the spectrum that is not too hard or plush may find it a good fit. If you want to learn more about this budget choice, visit our in-depth review. Aches and pains radiating from your lower back is common for many sleepers (upper back pain is less common). However, going to sleep shouldn’t be associated with added pressure on your waist. Now, keep in mind that firmness and support are not the same characteristics, even though quite a lot of people commonly get them confused. You can easily have a soft or plush mattress which still offers fantastic support. At the same time, if your bed is firm, it doesn’t mean that it would give poor support or lack comfort. An adequate level of support should genuinely result from a mattress that manages to align your spine properly. At the same time, the bed should also remain perfectly comfortable. If you experience pressure, it could be because the mattress is not comfortable and you can’t seem to find the position that helps you relax. Firmness relates to the initial and subjective sensation that you get when you lay down on the mattress. The question many people as is: are firm mattresses truly better for back health issues? Now, when it comes to back sleepers, there is an ideal firmness for most, and it is medium-firm. This means that you should aim for a new mattress that falls into that category on the firmness scale. In this scenario, ten is the extra firm setting. 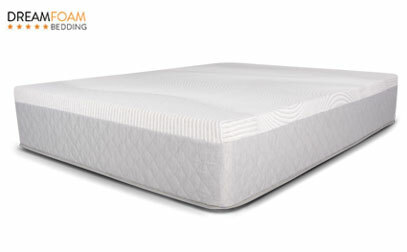 This is the perfect firmness level for so many because it brings the necessary balance between the push-back support and the required softness for comfort. This should remove the pressure from your lower back and allow for a good night’s sleep. With that said, some people tend to feel that a softer or firmer mattress is better for their back. Of course, this is somewhat individual and it is based on your sleeping style. Another consideration to account for when determining the ideal firmness for your back pain would be your weight. For instance, the heavier you are, the more pressure your body would exert on the mattress and the more it would impact it. Therefore, you might be looking at something firmer to compensate for this sinking. On the other hand, lighter weight people tend to stay away from those as it might get them feeling as if they are on a board on top of the mattress. They could potentially exacerbate their back issues. 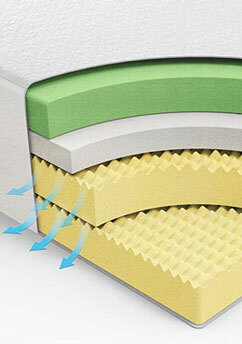 Also, keep in mind that most mattresses have a “break-in” period where the firmness level may change. Want to explore the best firm mattress picks out there? We created a firm mattress buyer's guide just for you. If there is an overly vital area to be attentive to when suffering from back pain, it’s the pressure points that an improper mattress can cause on your body. These points mean that there is extra push back to a specific area. 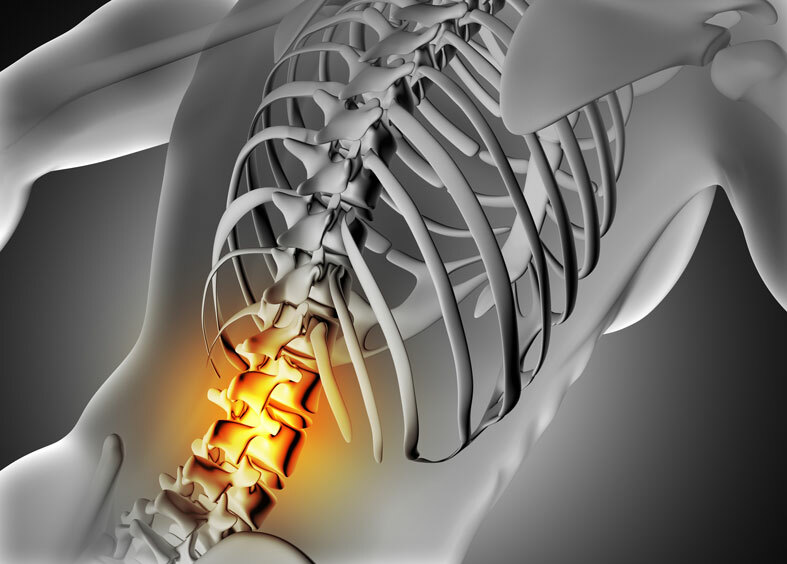 This can cause misalignment throughout your body and your spine. Once it has moved out of alignment, there is an increased amount of pressure placed on your spine. That’s one of the common causes of back pain. Thinking about it that way may just help you answer the question, “Is a firm mattress good for your back?” from a whole new angle. With this said, it’s essential to ensure that you aren’t sleeping on a bed that places pressure on your spine. This is also true for any major joints. That’s what’s going to allow your body to rest in a relaxed state. The chance of pressure points forming along the spine as well as the lower back is diminished dramatically when the appropriate product is picked. Pressure points are capable of causing long-term deformations and pains along your spine. This isn’t something that you can likely afford as it can quickly turn into a chronic condition. The type of material that you chose can be determined by your current back and health condition as well as the different requirements of people who prefer to sleep on their back, side or stomach. Before you dive into each material, we recommend checking out our comprehensive mattress buyer's guide. Is memory foam good for your back? Or is it causing back pain and hurting your overall back pain health? In fact, memory foam may be your best option, so you may just need an updated product. Our research reveals that people with back problems usually prefer addressing them through memory foam solutions. Studies indicate that the majority of people who have gone through a painful experience resulting in back pain own a memory foam mattress because this is what brings them satisfaction and pain relief. It is all due to unique properties as well as the behavior of this foam. Returning to the initial point of firm vs. soft, an important feature to consider is the density of the foam. This is where things get a bit more complicated given the physics involved. To keep it simple – 5 PCF memory foams should provide you with optimal spinal alignment and support. On the other hand, medium density foams of 4 PCF offer a little less contouring while the low-density ones between 2 and 3 PCF are not likely to be as effective as the previous ones. Keep in mind, though, that a lot of the modern mattresses come with various infusions to enhance the coolness as well as the responsiveness of the mattress. Latex is another highly recommended material which is also regarded as one of the best options for chronic back pain issues. The most appealing thing about it is the fact that it’s more responsive than memory foam and it’s generally cooler. However, it’s also not typically quite as contouring. 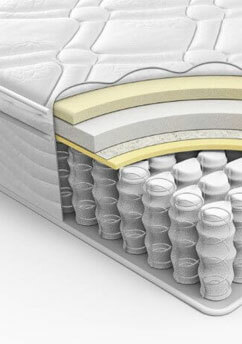 Mattresses made of latex rate quite well amongst people who have back issues and about 33% of people who own a bed of this kind tend to claim that the unit has definitively provided them with pressure relief. This is a premium material which is rather spongy. It is going to push into your body instantly which attempts to maximize its contouring capabilities. This is a highly recommended option for people who suffer from severe back pain. It is a premium option, and it is usually a bit more expensive in comparison. Now, when it comes to innerspring options, what you need to consider is that there are orthopedic solutions that are known to offer full-body level of support. These solutions tend to take advantage of the pocket spring/coil system, which is quite popular. These are mattresses that contain hundreds or thousands of coils, and each one wrapped individually. They act independently and on their own to enhance the contouring capabilities of the mattress. However, some can be a bit lacking in this regard when stacked against regular memory foam options. The general rule to consider if you decide to buy a mattress of the kind is to aim for between 1,000-2,000 springs. If you weigh more than 400 pounds or so, you should consider a mattress with more than 2,000 springs or look into the gauge of the wire. This could be a great option for pain treatment, but do your research; if less coils are used, find out about the properties of the wire. About 80% of sleepers are likely to come across some type of lower back pain throughout their lifetime. Of course, it goes without saying that not everyone is actually affected in the same way by these issues. However, this doesn’t mean that you should stay uninformed about them. Some have the potential to get worse over time. There are two types of back pain that are commonly observed: Acute pain that lasts for less than about six weeks and chronic pain which is less frequent but longer lasting. This is according to the reputable Mayo Clinic. The breakdown is followed by serious research and studies carried over periods of time and a lot of back pain sufferers. With this in mind, there are also different causes for back pain (even cancer). Here are a few common ones and some tips on how to prevent them. Lower back or lumbar pain could result from a range of different causes. However, these are causes that are associated with the lumbar disc directly or with muscle strains. This could actually result from sudden movements, lifting heavy objects, or any other twists. In any case, the thing that you need to do here is to get a proper and professional consultation with your doctor. This is based on the prediction that you might have fallen into a specific situation with particular medical requirements. These might determine the firmness as well as the material type of your bed. The only person who could provide you with thorough and actionable advice on the mattress that you should get is your doctor. And, keep in mind that this should happen only after careful and thorough examination. The source of the pain needs to be isolated and targeted properly. Believe it or not, stress is likely to be the most common cause of issues with your back. It might be hard to measure the exact amount of pressure that you might be feeling, and there are quite a few studies on that matter which show that stress could cause a lack of sleep. This means that you could be turning and tossing quite a lot through the night. The more you do so, the more susceptible you are to straining and pulling a muscle. But that’s not the worst part – you can be more vulnerable to falling asleep in a wrong position that you are not used to. This is what could make matters worse. There are a few things that you could do here to rectify the situation, apart from getting a proper and comfortable mattress. First, you could get a massage – this could potentially alleviate a lot of the stress that has been built up (as long as your doctor okays it). You should also eat more nourishing foods and consider exercising properly. Sleep disorders usually entail breathing related problems, snoring, or sleep apnea (read our full guide about beds for sleep apnea). When your back is supported firmly and properly, the air can easily and freely flow to your lungs. This is going to minimize the effects of sleep conditions of any kind, and it is also going to reduce snoring. There are also a few different sleeping disorders that can also have an impact on your back pain. It’s important to understand that sleeping disorders also translate to a lack of sleep. Just as with stress – you may fall asleep in a wrong position, sometimes bringing far more complicated issues. Sleeping with chronic back pain can turn your evening into a nightmare. Luckily, the right mattress can help move you in the right direction towards a better night of sleep. Remember, we don't believe there is one mattress that stands above the rest when it comes to back soreness relief. It's all about finding one that meets your personal preferences (including materials), budget, and unique pain issues. We hope this guide was helpful to you. If you have any questions, don't hesitate to leave us a comment below! Hi Mark thanks for the great article! I have read a lot of good stuff about talalay latex mattresses on reputable websites like WebMD. They recommend it to be the best for proper sleep and alignment of the spine. Do you have any comments on their bed system? And by the way I am with you on the big game! Superbowl this weekend! We haven’t reviewed Swiss Dream Beds yet but I’ll put it on our to-review list. Latex beds really have a lot of great qualities on the whole and we haven’t seen issues with higher tier latex products. They are a bit more expensive though. This a great article. 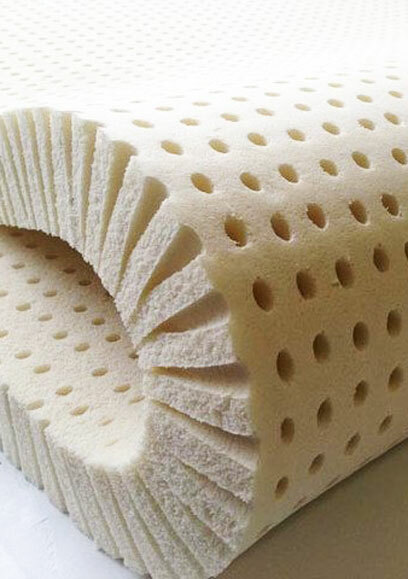 I really got impressed with the ” Type of Mattress Material” coz generally people do not show concern with material but you have effectively expressed the importance of the same.So many reasons and clarification of all the reasons.It is really very helpful.Thanks for sharing. I note that there was no mention of air beds. Do they not work for back sufferers? Hey Mike, I would not recommend airbeds for back pain. What about degenerative disc disease ? We are researching degenerative disc disease right now. The post should go live in the next 20 days or so. don’t see post for degenerative disc disease. I checked, and it’s coming soon! What firmness do you recommend? I would assume firm? And also depending on weight. I recently ordered a medium Alexander Hybrid by Nest and my lower back pain is just awful. I’m hoping to exchange for a firm and hope it solves the issue. Hi Annie. So sorry to hear of your troubles. More than anything, you need to go with what feels best for your body. If a firmer bed gives you a mix of comfort and support that helps you sleep better than that’s great. It’s all about what works best for your body. In general, we find that most folks with back pain may prefer beds in the Medium-to-Firm range, but how you experience firmness will depend a lot on your individual body shape and size. Good luck to you. Your article was wonderful. Just the information I was looking for. My question is about the box spring. I have been told that needs to be replaced in addition to my mattress. What are your thoughts? Currently, I do not have a platform bed. Keeping your box spring current can improve the longevity of your bed as an out of date foundation may cause sagging in your mattress over time. Not all brands require a box spring, however, and we’d recommend discussing this with the customer service of the brand you end up choosing. They would better be able to direct you in terms of what you need to set up their mattress. My husband and I both have back problems. Would a Sleep Number Bed help since they claim to be adjustable for the different pressure points? It is possible, Mary. Do you have a store near you? You may think about going to try one out to see if it’s right for you. Best of luck to you, and let us know what you decide on getting. Out! Simmons is my favorite but as I grow older I expect my mattress to change not the bed my body!! Unless it’s defective your mattress should last a good 10 yrs and clean it by vacuuming it regularly and using a good protective cover that’s why they sell them!! Dust mites live dead skill cells so why do you even want to sleep in something you never saw!! Simmons new silver line is anitiallergen antimicrbial! That’s a winner for me if it fits my body right! I wake up with a lot of back pain and have been thinking about getting a new bed to help with it. I think that it is awesome that you can get a 365-day warranty on the bed. It is really good to know that the support on the back is what I should look for. Hi there, thanks for the review!! Do you know of any mattress made out of bamboo? Can you include in the review? I transitioned all my sheets from cotton to Bamboo Lyocell because of my allergies and because of the environment, and I was wondering if mattresses come in Bamboo Lyocell as well.